Open Educational Resources (OER) are often defined as freely available material, in some kind of media, to support teachers and students on the task of learning some subject. These resources are valuable material that any teacher could use in its teaching activities. However, despite having many existing available repositories hosting these kind of resources, it is not always easy to find useful and good items. The main challenges are that 1) OERs are often spread over different repositories, so a teacher might not know the existence of all these portals 2) the quality of the resources may not be always assessed (well, this is the web) and 3) many portals have relatively simple and mostly syntax-based search engines. Our research group has been working on a portal for open educational resources (Plataforma MEC de recursos educacionais digitais) with the objective to gather OERs from different sources and to provide social networking functionalities (resource ‘liking’, followers, user reputation, and others), with the main objective of making the search and finding of good qualility material easier. 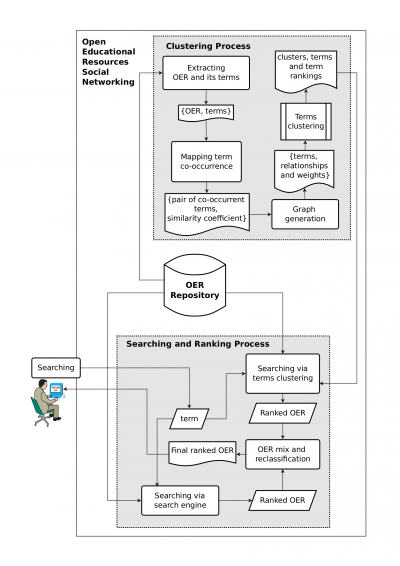 Once an OER is included, its metadata is indexed and it can be further searched through an instance of the Elastic search engine. In addition to the textual search, we also add more parameters to return objects based on relevance or other metrics. We (as part of the studies of Marina Pimentel and Israel Sant’Ana) created one hybrid ranking method based on terms clustering The idea is to, in addition to the main ranking produced by the search engine, to create a cluster of words using terms extracted from the metadata of the objects, based on terms co-ocurrence. To produce the ranking, the process is divided in several phases, as seen in the Figure below. The produced ranking for a given word enabled us to empirically see that, with rather simple modifications in the original metrics, we could improve on the search and to produce better results. Our paper describing the terms clustering ranking approach: Marina Pimentel, Israel Sant’Anna, Marcos Didonet Del Fabro Searching and Ranking Educational Resources based on Terms Clustering, ICEIS 2018, Portugal.